Users of Word can now master the newest version of Word quickly. This advanced training course in Word 2013 provides skill development in advanced editing and formatting tasks, inserting and formatting pictures and illustrations, using comments and tracking, and more. This Microsoft Word 2013 Advanced training course can be delivered at your premises by one of our expert local or international trainers or live online using our HIVE technology. This extensive training course helps participants develop advanced skills in Word 2013, so that they gain mastery over it. 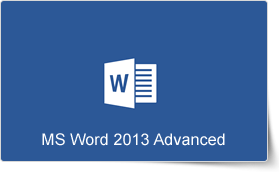 During the course, participants will gain deep knowledge and use of the advanced features of Word 2013. This advanced training course in Word 2013 provides comprehensive lessons in using views and Word window tasks, advanced editing and formatting, formatting pictures and illustrations, using tables and special objects, using translation and language review, and use comments and tracking. The short course offers easy-to-understand and comprehensive training lessons that help participants to gain mastery over Word 2013.